When I first moved into the house I live in now, there was a ramshackle greenhouse out back. 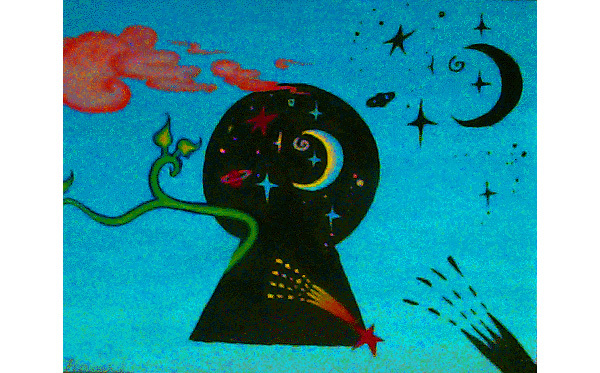 I painted a mural on the door that involved a keyhole that peeked through to another universe and seemed to cast an interdimensional shadow. I later painted the same design on a small canvas. In 2010, when I was receiving daily radiation treatments for cancer (I’ve been cancer free for two years), the radiation treatment team liked my painted shoes so I pointed them to my online collection of my paintings. When I came in the next day for treatment, I saw that they had downloaded the keyhole painting and were using it as a screen saver in their control room on multiple monitors. Touched, I gave them the original canvas. They hung it on the wall, but the state inspectors told them that they couldn’t hang paintings on the wall of the control room, so they put it in the treatment room. As far as I know, it’s still there. People in the county where I live see the painting every day if they are being irradiated as part of a cancer treatment.